Grab your robots, enginseers, and friends who are definitely not sentient machines because it’s time to take a look at one of the new Specialist Detachments out of Vigilus. Join us for a preview of the Cybernetica Cohort for the Ad-Mech. If you are an Adeptus Mechanicus player, then you understand that true power doesn’t life in flesh–which is weak and subject to corruption. But rather in the pure, uncorruptible, everlasting machine. Praise the Omnissiah and so on–just nobody tell them about the Gellerpox or they’ll get all purge-y. 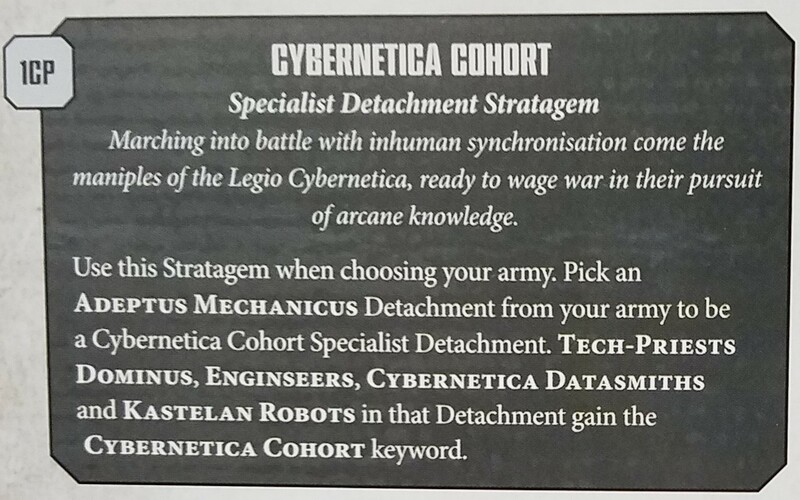 However, there’s no better way to espouse your semi-heretical belief in the superiority of machines than with the new Cybernetica Cohort specialist detachment out of Vigilus Defiant. We’ll start with the Stratagem, which gathers together Kastelan Robots and their support squad. Everything you need to make sure those robuts shoot your enemy off the table. And this fact is backed up by your Stratagems, which exist to facilitate your units of Kastelan Robots and their devastation. There’s Power Surge, which allows your robots to secure a charge pretty handily. Adding three to your charge rolls is pretty phenomenal–and all you need is a Datasmith to help support them. You could lump all your Kastelan Support in a single basket (which is efficient but questionable) by using Field Commander to nominate a Datasmith to receive the Warlord Trait, and just run him up alongside your Kastelans. Of course he’ll have to move fast because your Kastelans will be advancing nonstop. Getting to treat Heavy Weapons as Assault is fantastic even if you don’t advance–you’ll still have better firepower all around, so you can keep repositioning while still remaining accurate with the phosphor blasters. Or get even closer for the Incendines to soften things up before your inevitable charge. 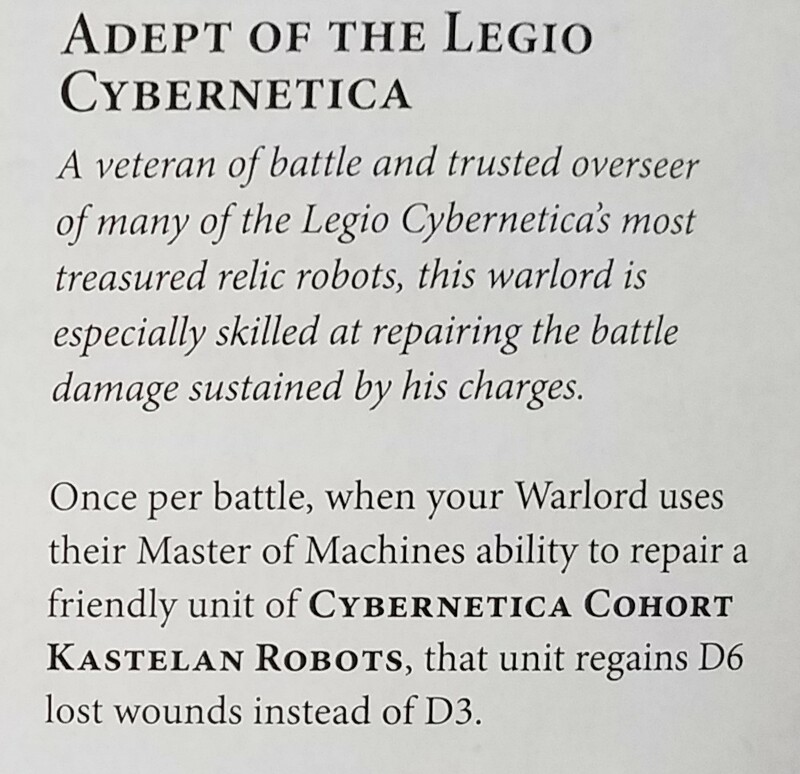 The Cybernetica Cohort’s warlord trait is designed to keep your Kastelan Robots operating at maximum efficiency. You can see why you’d be tempted to lump all of your Kastelan eggs into one Datasmith basket–this lets you get a powerful support character that only buffs your Robots and helps keep them up and about much longer than they ought to be, with the ability to take one from nearly dead to full health if they’re this Warlord. 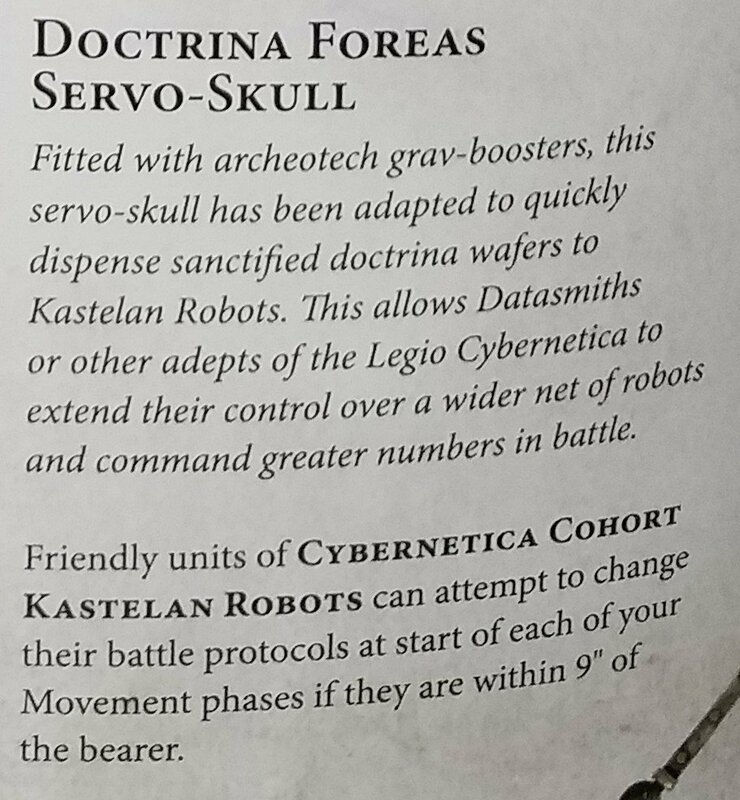 And you can give them the Doctrina Foreas Servo-Skull, which flies around handing out wafers (or punch cards or USB drives) to change Battle Protocols if they’re up to 9″ away from the bearer. All in all, this looks like what we expect Specialist Detachments to do. They tend to center around one or two units and help them shine–they’ll cost you command points, but in this case especially it seems worth it. Will this make up for what the Adeptus Mechanicus needs to help their army overall? I’m not sure–but I do think you’ll be seeing more of these units sprinkled into Imperial Soup lists. Whether Indomitus Crusaders or Sword Brethren, or Tempestus Drop Forces or Emperor’s Wrath Artillery, the Imperium have access to a ton of new toys thanks to Vigilus Defiant. Time will tell how they shake out–but having seen the previews so far, what do you think? Specialist Detachments seem to be heavily weighted to the Imperium right now, do you think this will change the makeup of Imperial Soup?